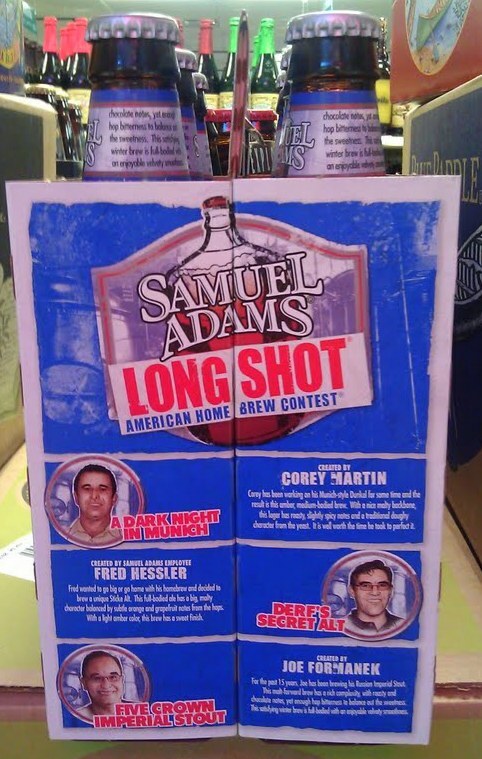 The annual Samuel Adams Longshot release, comprised of three winning homebrewers' recipes, is now available in area stores. You probably remember our own Rio Rancho homebrewer Ben Miller's smiling mug gracing the Longshot bottle a few years back when his Barleywine was one of the winners. Well, you don't have to worry about his face staring back at you while you enjoy this year's winning beers: a Munich Dunkel, a Sticke Alt, and an Imperial Stout. You have to hand it to Samuel Adams for not picking an IPA or DIPA to enhance sales and actually choosing beers of less popular styles on merit alone. Good for them, and congratulations to the winners. Maybe we will see their creations at ABQ Brew Pub in the future??? 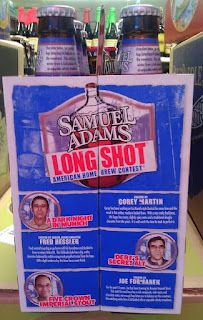 Expect to pay around $10 for a six-pack of Longshot. I found this at Kelly Liquors on Wyoming. And from Marble pub manager Josh Morales: the 2012 Marble Reserve has been tapped, $6 a goblet and $20 a growler refill. Enjoy bourbon barrel aged rarity while it lasts. Looks lik I will be heading to Marble tomorrow for a Gowler Fill. Thanks for the for the heads up.